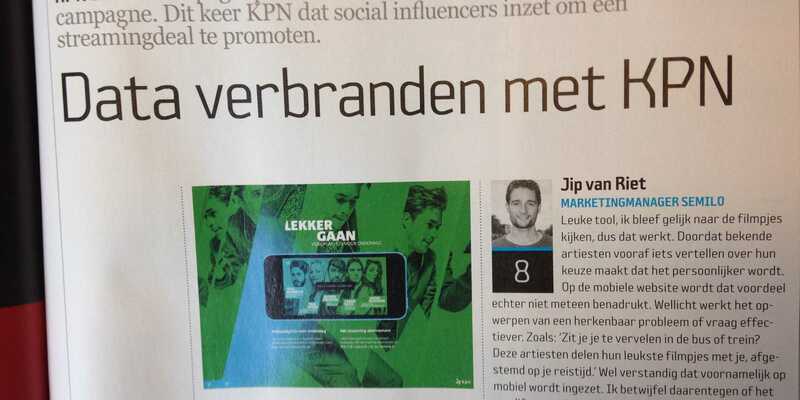 Michel van Velde, founder and CEO of One Shoe, gives his opinion about KPN's campaign 'Lekker gaan' in Dutch magazine Emerce. In this campaign KPN uses social influencers to promote a streaming deal: an internet subscription with 5GB of data traffic. Lekker Gaan is the first campaign in which KPN explicitly focuses on young people, especially people who want to stream videos online anywhere, anytime. Five well-known social influencers selected their favourite video content with a maximum duration of 13 hours. The viewers decide the length of the playlist. "There's no doubt your amount of megabytes (MB) will indeed be 'going hard' with this streaming subscription. It's obvious that KPN wants to earn money with massive use of internet subscriptions." "I doubt that the video content is attractive enough to purchase a subscription. The art direction across channels is good, but there's minimal call-to-action in the promo. This could have been done better. Furthermore, the User Experience on Mobile is done pretty well but it needs some improvement on PC or laptop. Too bad, because these devices can also be part of a customer journey."